A project for providing better access of cycle rickshaw to the residents of Chandigarh by means of direct dial-a-rickshaw facility, to support livelihood of cycle rickshaw operators and to protect environment. Get cycle rickshaw at your doorstep just by making a phone call. Trusted network of cycle rickshaw operators reffered by open community. About 25,000 cycle rickshaws are operational in the Chandigarh area, transporting 5 lakh passengers per day, and thus saving estimated 75,000 litres of fuel. 114 tones of fresh air would be required to burn that fuel, otherwise. 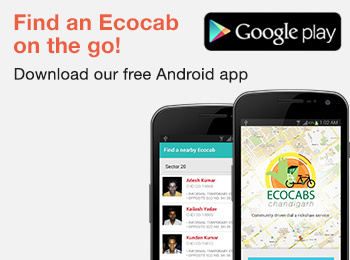 Find an Ecocab on the go!